There are about three dozen of these character studies, easily read in ten or fifteen minutes. Most are well written; some are wonderfully written. All of them, taken as an entity, present a more complete understanding of President John Calvin Coolidge (1872-1933) than any of the standard biographies, including a classic tome by his contemporary, word-happy William Allen White. New Englanders are usually observed as somewhat flinty and sparse of words. Coolidge fits nicely in that category. The flinty was there, but well hidden from public view; the sparsity of words, is legendary. Calvin Coolidge as a young Amherst College student. Born and raised in rural Vermont (actually most of Vermont is rural), he was the son of a farmer-shopkeeper and occasional state official. Calvin grew up doing farm chores and attending the local school. Both his mother and older sister died when he was in still a youth. Calvin and his father, sharing that unspoken grief and loss, bonded and remained close for the rest of their lives. His academic grades were above average, but not superior. It was enough, however, to warrant an education at Amherst College in Massachusetts. Once graduated, he read law (still an acceptable legal education), passed the Massachusetts Bar, and remained in the Bay State for the rest of his life. As an adult, the only ones who called him Calvin or “Cal” were family. At Amherst, a few of his fellows called him “Cooley,” but that didn’t last past graduation. Adult friends called him Coolidge, but most people called him Mister Coolidge. That was New England. That was also early 20th Century. Coolidge handled meet-and-greets on his own terms. Calvin Coolidge became a middling attorney, nothing out of the ordinary. His practice in Northampton, where he settled, was modest. Partly from general interest, and mostly from the need to augment his income, he became involved in local politics: a seat on the council; the Mayor of Northampton. Eventually, he won a seat in the State Legislature. “Glad-handing” and “pressing the flesh” were not traits inherent to Coolidge, but he certainly understood the political need of personal contact with his constituents. Every few weeks, he would walk down to the local barbershop where the men would gather of an evening to smoke a cigar, have a beer and exchange news. Everyone knew Mayor Coolidge. He showed up, circled the room, shook hands with everyone, and mumbled “how-do.” Then he smoked one cigar and had one beer. If anyone wished to talk to him, he listened. When the cigar and beer were finished, he circled the room again, shook hands all around, and mumbled “g’night.” But his townsmen understood perfectly. He was accessible; he was one of them. 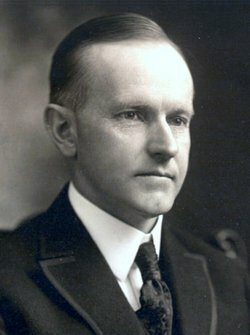 There is an essay written by a fellow who only knew Coolidge casually. He had occasional business in Boston – about a two hour train trip from Northampton. Coolidge, the state legislator, needed to attend sessions in Boston a couple of times a week. Train travel in the early 20th century was a pleasant experience; a place where a man could leisurely read his newspaper without being bothered. Then as now, commuter trains have seats designed for two or three. The train was somewhat crowded that day, but the businessman found a seat next to Calvin Coolidge, Mayor and Legislator. Both mumbled a perfunctory “excuse me” or maybe even “good morning” and proceeded to read their individual newspapers. For the rest of that ride, they rode in silence. Arriving at their station, they rose to depart. The businessman mumbled something like “Looks like rain,” or “Nice day,” to which Coolidge replied with, “Yup.” Then they went their separate ways. After Coolidge retired from the Presidency in 1929, he returned to Northampton to write his biography. He also received a ton of mail and was invited to sit on various boards or trusteeships. He needed a secretary, and engaged Herman Beaty. Beaty contributed to Meet Calvin Coolidge, remarking that he had never met the President before, and was amazed by all the misconceptions. He had always heard about “Silent Cal,” but found the former President to be chatty and positively gabby. He had also heard that Coolidge was a laconic worker who preferred “banker’s hours.” In truth, whatever time Beaty arrived for work, Coolidge was always there first. He had heard that Coolidge could squeeze a dollar hard enough to make the eagle scream. 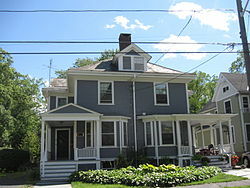 The ex-POTUS had put aside a sizable retirement sum (no POTUS pensions, then), and very quietly distributed discreet help to some of his Northampton neighbors who were hit hard by the Depression. And when he donated his old clothing to charity, he made sure to remove all labels and identifying tags, and insisted on having them sent to out-of-town shops to protect the anonymity all the way around. This entry was posted in A POTUS-FLOTUS Blog, Calvin Coolidge and tagged "Meet Calvin Coolidge", "Silent Cal", American history, Calvin Coolidge, Calvin Coolidge Northampton Mayor, Calvin Coolidge's Secretary Herman Beaty, Coolidge the local politician, Coolidge the New Englander, Coolidge's youth, Feather Schwartz Foster, history, President Calvin Coolidge, Presidential history, US history, White House history. Bookmark the permalink.